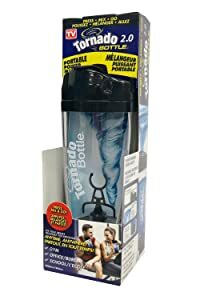 Introducing Tornado Bottle 2.0 Vortex Mixer! 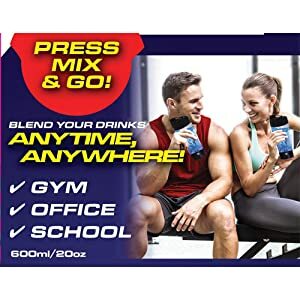 Mix a variety of beverages: juice, cocktails, coffee, tea, protein shake, baby formula, etc! Take it to work, school and the gym! It goes wherever you go and easily fits in any cup holder, backpack, or purse. With Tornado Bottle - life's easy - just press, blend and go. Now you can mix your favourite drinks anytime, anywhere. Cyclonic Agitator, when you press the button, it automatically spins up a Tornado inside to mix any cold or hot beverage just right. Its superior design is whisper quiet while its powerful mixing wand makes any drink fast and easy! Tornado Bottle is great for Delicious Protein Shakes, Veggie & Nutrition Drinks, Chocolate Milk, Kool-Aid for the kids and Baby formulas. And even sauces & gravies! The bottle's rubberized base is stable and grips to surfaces easily to prevent spilling. And its self-sealing lid makes sure your drinks are safe even if they fall over. No more fumbling and stumbling, sore arms from shaking, lumpy watery drinks, or messy stirring spoons or spools. 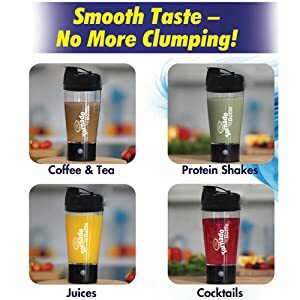 You could spend a fortune on those old fashioned bulky blenders, leaving you late for work and with all the messy clean up. 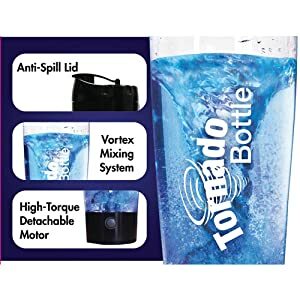 THE TORNADO BOTTLE Vortex mixer is the quick and fun way to blend a beverage. 20oz / 600ml capacity. Perfect for athletes, gym goers or just daily uses. BUILT-IN MIXER POWERFUL ENOUGH TO automatically mix drinks with the press of a button. Leak proof with food grade materials. 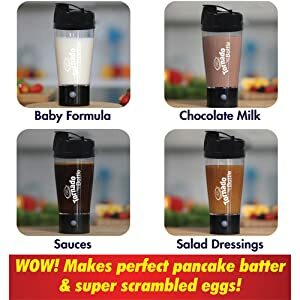 PERFECT FOR MIXING A VARIETY of beverages: juices, cocktails, coffees, teas, protein shakes, baby formula and more!